Funding for two major bus route upgrades in Dublin were included in the government’s capital plan, the minister for transport has confirmed in the Dail this week. Such projects could mean cycling upgrades on the same routes but, in recent years, large public transport projects have also stalled or blocked cycling improvements in the city centre. “Funding for the Blanchardstown to UCD and Clongriffin to Tallaght BRT projects is included in the capital plan,” said transport minister Paschal Donohoe. He also confirmed that a third planned route from Swords to St Stephen’s Green is shelved because government want to go ahead with a revised Metro North along much the same route. The planned Capital Investment Plan runs from 2016-2021 and may depend on future government/s. While the planned projects in Dublin are called BRT or “bus rapid transit“, the indications so-far is that the bus upgrades planned in Dublin would not meet at least some international standards for BRT because of a lack of segregation from general traffic. The Institute for Transportation and Development Policy states that one of the key requirements for BRT is “Bus-only lanes aligned to the middle, not the curb, of a road” — while, in Dublin so-far, BRT has been shown with kerb-side drawings and illustrations. 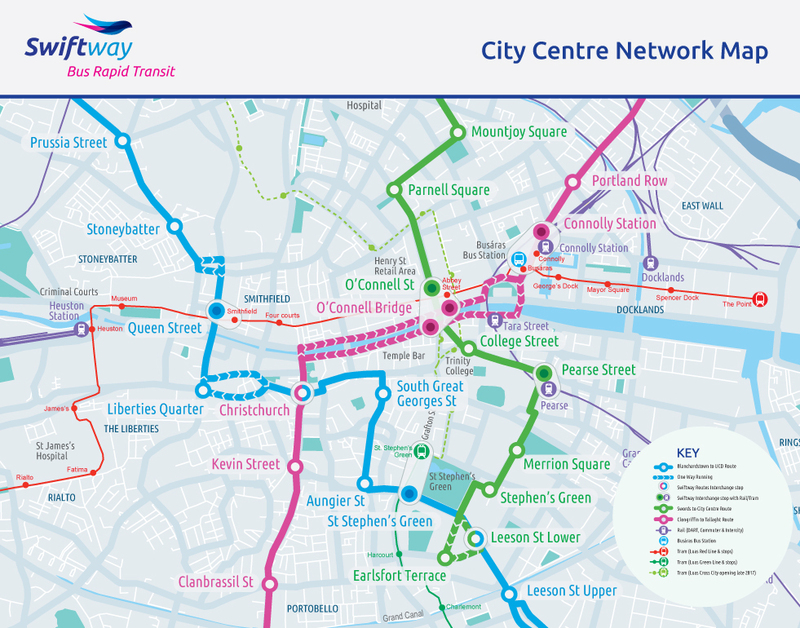 Belfast BRT plans completely ignore cycling as a transport mode. Cyclists are expected to ride in BRT lanes. But obviously, bus lanes are not cycle infrastructure. BRT is designed to speed up bus journeys. This is not a good thing if you’re a cyclist in front of a bus with a timetable to keep. It’s important that cycling is included properly, giving separation where needed. The halts need to be bypassed on the pavement side and secure bike racks provided to allow multi-modal journeys. Cyclists need a strong voice at the outset, so cycling is designed into the plans and costed in the basic spec, rather than treated as an awkward add-on, bodged, fudged and dangerous to use.